I’m working on finishing up a home office and just added some new accessories. Once the office is completed I’ll post more photos! Did you know that more that 50% of US businesses are home-based? The homeprenuer or soloprenuer trend is growing big in the US. According to the SBA (small business association) an estimated 6.6 million home-based businesses provide more than half of their household income. So home offices are a huge trend and will continue in order to keep up with the growth of the home-based entrepreneur. Creating the perfect home office atmosphere is critical because your environment should reflect your personality. It ought to be well-planned and organized. If your office is inspiring, stimulating and innovative it will spark your creativity. If it’s boring, drab and cluttered, your creativity will experience the same outcome. Contact me if you’re looking to create a home office. I can help design from scratch or add some fresh paint, window treatments and accessories to spice-up your existing home office! 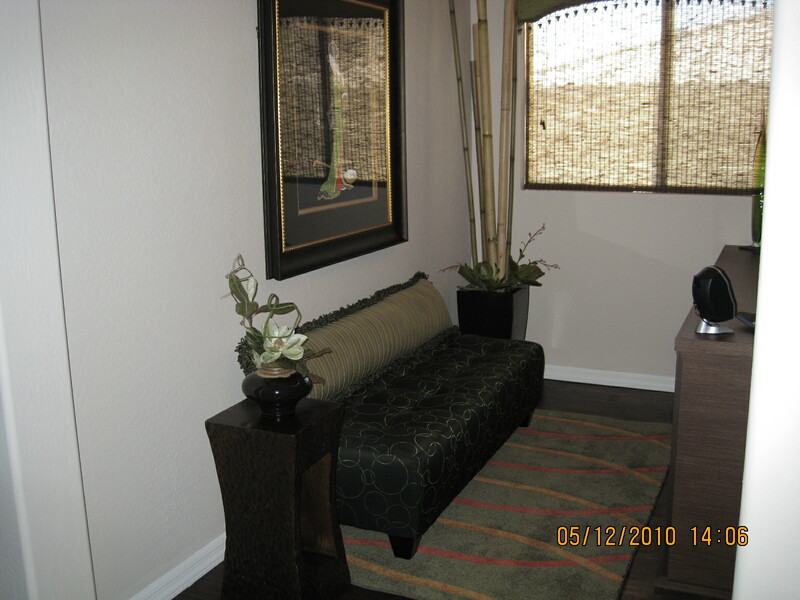 Article by Cheryl Sandella, ASID Interior Designer, Fountain Hills, Arizona ©2010 Cheryl Sandella. Sandella Custom Homes and Interiors, LLC. Home offices are very popular and we plan them in almost every home we design and build. Home Offices are being designed for work–from-home business owners, personal use and some serve both. The home office has become a necessity and a convenience for many, especially in today’s telecommuting business world. The design and feel of the office should work with the existing flavor of the house. Some people will just throw a desk and a few file drawers into a room. It then becomes cluttered and it just doesn’t make a nice environment to work in. The furnishings in your office should compliment what’s in the other rooms of your house. There should be ample room for what you want to achieve in that space. I like either an L or U shape configuration for the workspace. I also like to have built-ins to hide most of the equipment. Lots of file drawers and storage are a must. If the office is used mainly for pleasure then I like to purchase a unique desk and set it center stage on an area rug with built –ins to the side for display / storage. Decisions need to be made if the space will be used as a “dual purpose” room. I’ve installed Murphy Beds and stored computer equipment in a stylish armoire so the room can double as a guest bedroom. If this is your plan, and space / budget permits, then I would recommend a private bathroom and a closet that can contain storage for office staples and clothing for the guest. Some people like their offices to also double as a personal “hang out”. Many prefer to have a focal point, such as a wall of windows to glance at a mountainous view (which is what I have), a fireplace, or a built in bookcase showcasing photos of loved ones, collections or treasurers from a favorite vacation spot. I feel it is important to surround yourself with your favorite things. Create a space of comfort. Purchasing an ergonomic chair is a must! Some of the offices I design and decorate feature a sitting area of either two chairs or a small sofa. Most offices also feature a flat screen TV and piped in music. The right color scheme is a must. Color can have an effect on your mood. Good colors to choose are green, blue or neutrals. Other more intense colors like red, yellow or purple can be used as accents. Green is calming, earthy and easy on the eyes. Blue is the most versatile color, it is also calming and relaxing. Red stimulates, yellow energizes and purple can bring out your imagination. Lighting is another must. Over head and task lighting is very important, not only to properly work but to create a nice atmosphere. I like to put my lights on a dimmer switch. I also like having a ceiling fan – it helps to keep equipment running cooler too. Make sure you have enough electrical outlets installed for all of the equipment that will be used. When I custom design the furniture, I make sure to hide all of the wires. For the full time home office – custom framed cork boards (they come in all colors now) or custom framed white or black boards can be a good idea to hang on the wall to keep track of projects and schedules. Art and Décor complete the space so leave some money in your budget for the accessories. They pull the room together and speak your personality. For best results hire a professional. They will access your needs and make sure you have ample space and a style that fits your personality. Need help with your project? Start a Design Notebook. Get the FREE how to guide at www.sandella.net and click on FREE STUFF!